The new Renault Espace has secured a five-star rating from the independent passive safety evaluation body Euro NCAP. The new Renault Espace earned a global score of 81 per cent and is the 16th Renault model to earn Euro NCAP's five-star rating. and above this industry certification, the new Renault Espace delivers reassuring handling performance thanks notably to a range of driver-warning and occupant-protection technologies which contribute to the model's outstanding active safety credentials. The new Renault Espace has achieved an adult occupant protection score that positions it at the market's very top end (31.4 points out of a possible 38). 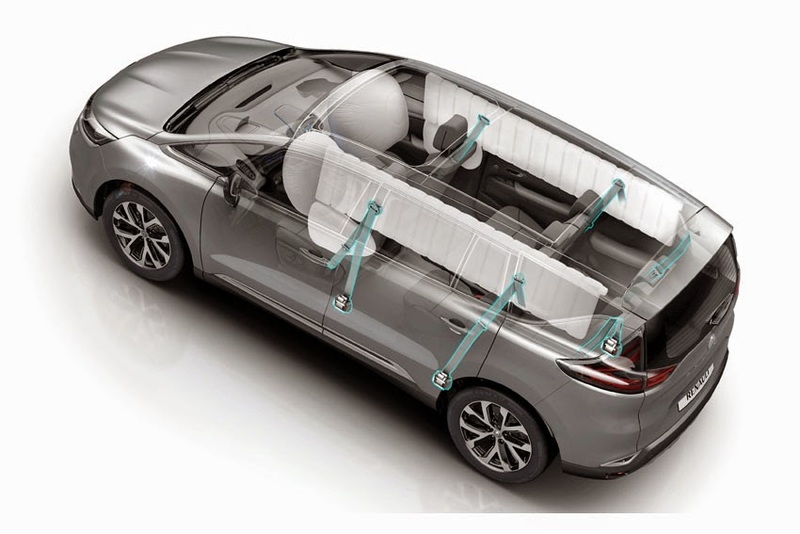 In the case of a head-on collision, occupants sitting at the front of the new Renault Espace are protected by two large-volumes frontal airbags which inflate as a function of the type of impact and the position of the occupant. Occupants are also held by anti-submarining humps incorporated in the seats, as well as by pretensioners complete with adaptive load limiters which adjust the load applied as a function of the impact's severity. The engine sub-frame also plays an important protective role in head-on collisions by absorbing energy due to its variable-resistance crumple zones. At the same time, the reinforced central cell is designed to preserve the cabin's integrity in even the most severe impacts. In the case of a side-on impact, front occupants are doubly protected by two latest-generation lateral groin/thorax/shoulder airbags and two curtain airbags. The child occupant protection score for the new Renault Espace was 44 points out of a possible 49, once again a result that positions it at the very highest end of the market. The new Renault Espace is one of the few D-segment vehicles that propose anti-submarining technology for second-row seats, too. Rear occupants also benefit from curtain airbags, as well as from pretensioners complete with load limiters.